I just bought this stroller not even 2 months ago and it's GREAT , It's not bulky and it's not hard to put together and my kids love it ! 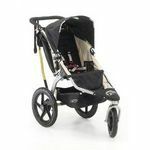 I have two children under the age of 3 and this Phil and Teds Sports Jogging Stroller has been my favorite piece of baby equipment for the past 3 years. The hardest part of owning it has been the decision to spend that much on a stroller. But I can tell you as a bargain hunter, it is WELL WORTH EVERY PENNY! As a single stroller it is awesome. The three wheel base with the swivel option on the front wheel makes it easy to manuver in tight places like clothing stores, and it allows it to fold up small enough to fit in my compact car trunk. We added the doubles kit when #2 came along, and it has been al life saver. For the first few months of the baby's life, we used the doubles kit up front while the baby laid comfortably in the base. Since then, I have used the doubles attachment for walks (got rid of all of my baby weight pushing both kids around), in stores, at amusement parks, and everywhere else you can imagine. It is well worth the money! I bought this when we found out I was pregnant with our first child. It has been the best investment ever. I bought this over a more traditional travel stroller because I wanted the option of two comfortable seats for when we have a second child! My son loves it. We have used the second seat a couple of time for trips with take with friends who have smaller babies. It is perfect. It is a bit clunky to fold, so I don't recommend it if you need to be in and out of the car often. With the classic version, you need to remove the back seat to fold it. All the wheels come off, though, so it does fold pretty flat for a double. It pushes like a dream. The air-filled tires make cobblestone streets a breeze. We've only had one fully flat tire. I replaced the inner-tube and we haven't had any problems since. I bought a small portable bike pump to keep in the basket and use it occasionally to keep the tires in top condition. 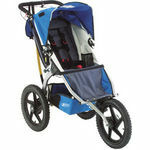 Phil and Teds Sport Stroller is easy to use and very versatile. 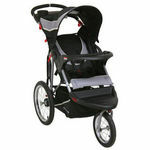 I was skeptical to buy such an expensive jogging stroller, but so far I think we are getting our money's worth. I bought this with the doubles kit with the expectation of having a second child in the future and not having to buy a separate double stroller. The double attachment comes on and off so easily! 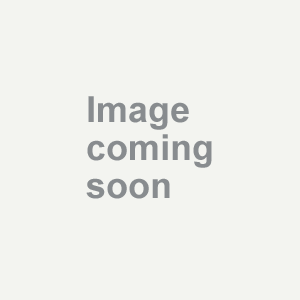 The four reclining positions are nice to hold a newborn up to a large toddler. My DD was able to sit in the next to upright position at 5 months old. The five point harness is nice, but useless right now since the lap part goes up to my DD's mid-chest. The upper straps swallow her up and sit on the sides of her head. She does have plenty of support though with just the lower (3 point) straps done. 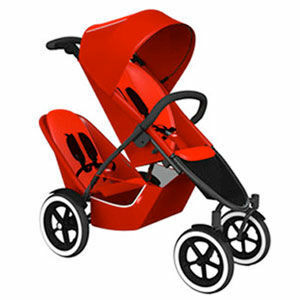 The stroller folds relatively easily, but you do need two hands. The instructions that come with the stroller were almost worthless so I had to figure it out through youtube videos. The sunshade does not do much to shade her eyes so I bought the UV sun cover that fits the stroller. It works very well. 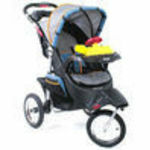 Overall I love this stroller but wish it came with more accessories for the money.